In the end, AzhwAr says “Those who meditate upon my sorrow in this decad, will melt like tiny sand particles in a spring (ground water source)”. Subsequently, AzhwAr explains the result of this decad “Those who recite this decad, due to having great love towards its meanings, will have the nature of fluid”. 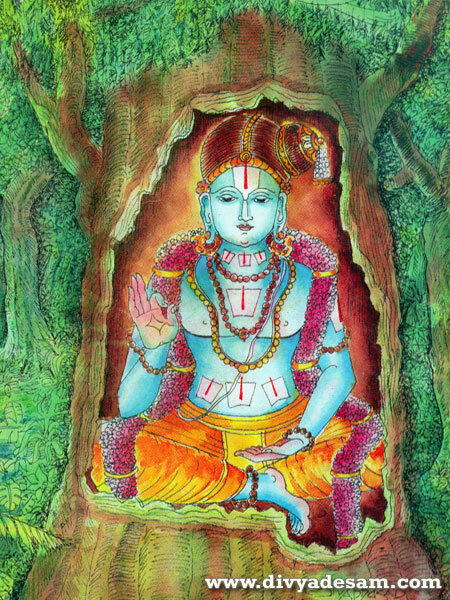 AzhwAr, the leader of AzhwArthirunagari, which is surrounded by fragrant flower filled gardens, who won over bAhya and kudhrushti philosophers, analysing with distinguished words, mercifully spoke these ten pAsurams among the thousand pAsurams which are incarnation of vEdham like bhagavAn’s incarnations, on the divine feet of the benefactor who destroyed madhu who robbed the vEdham which is the cause for knowledge; those who can recite with meditation, will melt like tiny sand particles in a spring. mARRangaL Ayndhu koNdu – For those who are drenched in devotion, like for those who are climbing hills, cannot speak/sing coherently; the words themselves become aligned properly; through noble words. madhusUdha pirAn adi mEl – On the divine feet of the one who has virOdhi nirasanam (elimination of enemies) as a natural attribute. nARRam koL … – The gardens too became evergreen as AzhwAr sustained himself thinking “We will surely succeed as we have sent a messenger to his private quarters”. AzhwArthirunagari surrounded by gardens filled with fragrant flowers. URRinkaN … – These pAsurams have not been learnt before [AzhwAr only revealed them]. That is, AzhwAr is saying “with my sorrowful cry, I have melted the whole world”. [Explaining the present tense in “urugA niRpar”] AzhwAr’s sorrow will end when emperumAn appears in front of him; but since these pAsurams are eternal, those who hear them, will not be able sustain themselves; they will melt like tiny sand particles in a spring, and become broken-hearted. What is the result of this? As melting on hearing the words of great devotees of bhagavAn is also part of the goal, this itself (melting) is the result [for this decad]. This entry was posted in thiruvAimozhi, thiruvAimozhi 6th centum on May 17, 2018 by Sarathy Thothathri.